Sixth Studio Album "Play To Win" Out Now! 2019 is officially STRIKER's 'Summer of Shred' as they will hitting the road this summer for multiple North American tour dates with DEATH ANGEL, STEEL PANTHER, HOLY GRAIL and BEWITCHER. Their shredding adventures will begin in Oklahoma City, OK on May 14th for US dates with DEATH ANGEL followed by a headlining show for Calgary's East Town Get Down Festival that includes Anvil. STRIKER will then support STEEL PANTHER for their Canadian dates from June 14th to June 25th and then kick off a short headlining tour from July 2nd to July 7th before joining HOLY GRAIL and BEWITCHER for the 'Deadly Ripping North American Tour', which will invade 21 cities in USA and Canada from from July 12th to August 4th. STRIKER is touring in support of their sixth studio album "Play To Win" released this past October via their independent label Record Breaking Records. "The Girl With The Stars In Her Eyes"
Currently On Second Leg Of Their North American Tour Last night, MICHAEL SCHENKER FEST kicked off the second leg of their North American tour at the world-famous Whisky a Go Go. The band will return to the Whisky tonight and tomorrow before making their way across the US with stops in Portland, Chicago, and New York before concluding in Austin. TX on May 18th ! Order the 12' single "Warrior" here: http://nblast.de/MSFHeartAndSoulFollowing the release of their successful debut album Resurrection, MICHAEL SCHENKER FEST have completed the recordings for their second studio album, which is scheduled to be released on August 23rd this year worldwide through Nuclear Blast. The album was mastered by Christoph 'Doc' Stickel for CS Mastering/Vienna, Austria. Additional recordings were completed as follows: Simon Phillips' drums recorded by Jason Mariani at Brotherynstudios in Ojai, CA. Bodo Schopf's drums recorded by Rolf Munkes at Empire Studios, Bensheim, Germany. Graham Bonnet's and Robin McAuley's vocals recorded by Jimmy Waldo at "Where's That Track Studio" in Los Angeles, CA. Unleash Lyric Video For New Single, "Searching For You"! Pre-order the album digitally to receive 'Searching For You / Voy A Encontrarte' and "Die For The Devil" / "Muere Por El Diablo" instantly (amazon and iTunes only)! Zenith contains 10 brand new anthems, bringing not only classic tunes, but also fresh blood to the band's unique sound. In addition, guitarist Jonathan Nordwall debuts as new permanent member of the group on the forthcoming record. Comments Olof Wikstrand on the new record, "Zenith is definitely the most ambitious project we ever engaged ourselves in. I think all together we spent over two and a half years to write, produce and record it all. We are super excited to finally get this one out to you all. Beware the 'Zenith Of The Black Sun'." With the drums having been recorded at Soundtrade Studios, Stockholm and the rest of the tracking completed at Hvergelmer Studios, Arvika, Zenith was produced by ENFORCER themselves. The artwork was created by Italian artist Velio Josto.Recently, the band announced their co-headlining North American tour with WARBRINGER! The trek will run kick off September 5th at Brick By Brick in San Diego, California and conclude on October 28th at Club Red in Tempe, Arizona. Discuss Zenith Writing And Recording Process In First Album Trailer! Photo Credit: Cintia RegueiroVisit ENFORCER at For hi-res photos and band logos visit www.nuclearblast.de/media. Copyright © 2019 Nuclear Blast USA, All rights reserved. You are receiving this e-mail because you are on our press list. Following on from the release of their successful debut album Resurrection, MICHAEL SCHENKER FEST have completed the recordings for their second studio album, which is scheduled to be released on August 23rd this year worldwide through Nuclear Blast. Recently, the band also announced they will be welcoming back Simon Philipps and Bodo Schopf - who each played drums in MSG - to the Michael Schenker Fest line-up. Simon who played on the MSG debut album will return as the main drummer on the upcoming second album. Due to his schedule, he is unable to be the live drummer for the upcoming US tour. This role will be completed by Bodo Schopf, who played on Perfect Timing and Save Yourself. With the sudden passing of Ted Mckenna, Bodo will be featured on the upcoming record but in a smaller role as he had the important job of preparing for the US tour. Mexican harsh electro act Hocico has announced that it will be embarking on the World Wide Extinction Tour in support of the band’s late 2018 album Shalom From Hell Aviv (Blasphemies in the Holy Land Part 2). Beginning on March 30 and continuing until October 1, the tour will see the duo of Racso Agroyam and Erk Aicrag bringing Hocico to a number of festivals, including Warsaw, Poland’s Dark Electro Fest, the Amphi Festival in Köln, Germany, the Hexentanz Fest in Losheim, Germany, and Seattle’s Mechanismus. 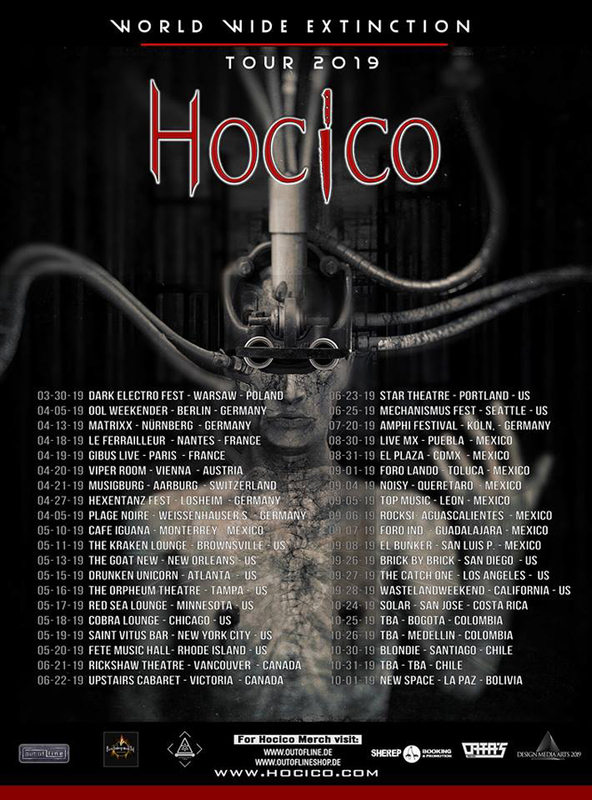 Additional dates will see Hocico performing throughout the United States, France, Austria, Switzerland, Costa Rica, Colombia, and the band’s native Mexico; a full listing of dates for the World Wide ExtinctionTour can be found on Hocico’s websites. Shalom From Hell Aviv (Blasphemies In The Holy Land Part 2) was released on December 7, 2018 via Out of Line Music. "Muere Por El Diablo" Lyric Video Streaming! Guitarist/vocalist Olof Wikstrand states, "Here’s something special for you! This is a tribute to our Latin American fans for being the best fans in the world!" DELAIN – Release Official Live Video For “Nothing Left (feat. Marco Hietala)”New Live Album + BluRay Hunter’s Moon Hit The Charts Worldwide! "2019 marks 10 years since we first released “Nothing Left” on April Rain. Nowadays it’s a rare treat to see the track performed at one of our live shows, but it hasn’t lost any of it’s power in the decade that has passed. Performing "Nothing Left" together with Marco Hietala was one of the highlights of the night in Tivoli, and in fact, the entire show felt like a highlight; it was one of my favourite shows of our career so far. You can relive the night through our new Live Album/Blu-Ray Hunter’s Moon. As it was the first time we did an entire tour with Marco as a guest, all songs featuring him, including Queen cover "Scandal" are included, and the video for "Nothing Left" is now available on Youtube. We hope you enjoy it!" #65 (Billboard Top 200)It is now available everywhere!